In this session Professors Will Jennings and Gerry Stoker will present evidence and analysis on the phenomenon of anti-politics and its likely impact on the 2015 General Election. The “anti-politics” phenomenon is complex but is reflected in negative attitudes towards mainstream politics and political parties among citizens. Those attitudes present an opportunity for some political leaders and a threat to others and challenge to all. Citizens themselves may be disengaging or simply disillusioned from mainstream politics and they may be exploring alternative ways of expressing their politics. 1. How widespread is the holding of negative attitudes towards mainstream politics among citizens? 2. Which groups are particularly likely to have negative attitudes? 3. What are the drivers of negativity? 4. Can we say with any certainty that negativity has increased compared to earlier political periods? 5. How have the mainstream and challenger parties responded to negativity towards politics? 6. How strong is the evidence that citizens are developing a new repertoire of political engagement? 7. What is the likely impact of anti-politics on the 2015 General Election? 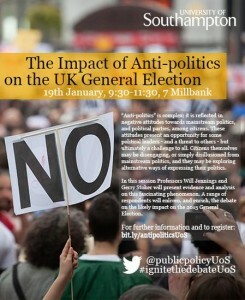 After the evidence has been presented a discussion session chaired by Dr Ruth Fox from the Hansard Society will enable the nature of anti-politics and its likely impact to be explored in more depth. This event is open to all. We hope to have a range of respondents to help enliven and enrich the debate. Click here for registration.